A couple of weeks ago, I took a photo of a damselfly that had about two dozen tiny globules stuck to the bottom of its abdomen. Upon closer inspection, the globules appeared to be bright red with tiny legs, so I suspected they were some type of parasite. Parasites they were. The tiny red globules were water mites, known scientifically as Hydracarina. There are about 1500 species of water mites in North America, and they’re very common in the shallow areas of lakes, ponds, and wetlands. Some species of water mites are parasites on insects like the damselfly in my photo. Parasitic mite larvae attach to a damselfly larva underwater. When the damselfly larva emerges from the water and enters adulthood, the mite larvae stay with it and also become adults. The mites feed on the body fluids of the damselfly and may get an added bonus of a free ride to a new pond or wetland to colonize. 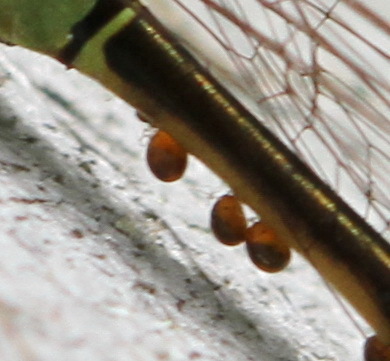 Damselflies and other insects usually survive the mite parasitism but may be weakened by it. 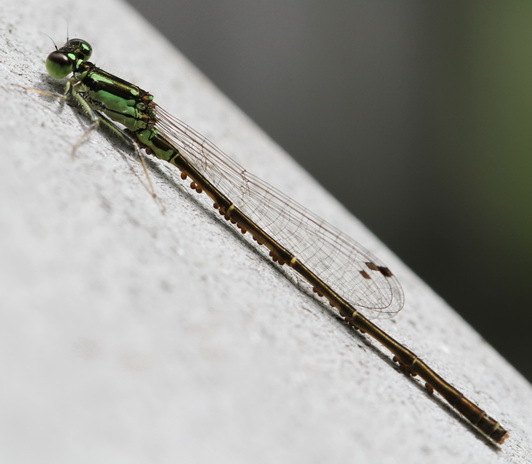 The damselfly in the above photo is a male Fragile Forktail (Ischnura posita), a roughly one inch long damselfly that’s common in eastern North America. Fragile Forktails are distinguished by a pair of broken stripes on the upper thorax that look like exclamation points. In males, the stripes are green. 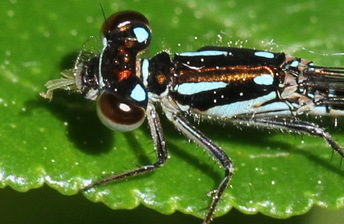 In young females, the stripes are blue. Older females turn a bluish gray overall, and the thorax stripes become less noticeable. Wow, I’ll have to look more closely at damselflies in the future! Thanks for your comment, natureintheburbs. I’ve been watching damselflies for years, and this was the first time I’ve seen one with water mites. Aren’t they amazing? I’ve seen a Carrion Beetle with Phoretic Mites. In this case they’re just hitching a ride to new food sources. Interesting! Thanks for your comment, daveonfidalgo. Lovely site with great ecology information.